It's been about two months since I was at the Oceti Sakowin camp in support of the movement against the Dakota Access Pipeline. I haven't found all the words I need to describe the whole experience. This is my first attempt to at least capture small parts of it. Bundled in three layers on top, two on the bottom, I pulled the gray prayer shawl-turned-scarf over my nose and breathed in. As I exhaled and inhaled again, breathing deeply, hoping my nose wasn’t fooling me, I recognized the ever-so-faint scent of campfire. The day I smelled the fire in my scarf was nearly a month after my return from North Dakota. I was walking in the woods on the grounds of the Sisters of Loretto, happily crunching through snow that had fallen the day before. The temperature was in the teens, cold for Kentucky, and I was glad to have thrown a pair of borrowed long underwear in my bag at the last minute. At Oceti Sakowin camp, the long underwear had served as my base layer under two other leg layers and a full-length down coat. The scarf I wore at camp and again at Loretto kept my neck warm and offered a wool filter for the cold air that burned my nose and throat when I breathed without such a filter. It’s been two months now since I was at camp, where I worked in a kitchen, most often as sous chef. Chopping frozen vegetables (everything was frozen, no freezer needed). Thawing food or water that had frozen overnight or been left alone too long during the day. Washing dishes (after thawing enough water to do so). Organizing donated food. Trying to be helpful in any way I could. I had allowed myself exactly one expectation for my time at camp: it will be cold. I didn’t have a way to check the temperature while I was there, but before I left, the forecast was for highs in the single digits to low teens and lows below zero – before wind chill. Realizing before my trip that my cold weather gear was not fit for North Dakota winter, I put a request on Facebook to borrow warm clothing. Generous friends came through with long underwear, sweaters, fleece for my top and bottom, wool socks, ski pants, face masks, yak tracks, ski goggles, two down coats, Hot Hands, more than I could actually take with me. Thankfully, the day I experienced the worst North Dakota wind was the day I arrived in Bismarck. The whipping winds reminded me of Chicago; I had to work to keep my balance, leaning into the air that pushed against me. I gratefully spent the first night in Bismarck. The previous night I had gotten very little sleep and wanted to arrive at camp with energy to give. After a good night’s sleep and a long shower (I wouldn’t be bathing at camp), I used a Facebook rideshare page to find a ride out to camp. Before going to Bismarck I had reached out to the friend of a contact I had there, but she turned out to be not only unhelpful, but hostile to my presence. 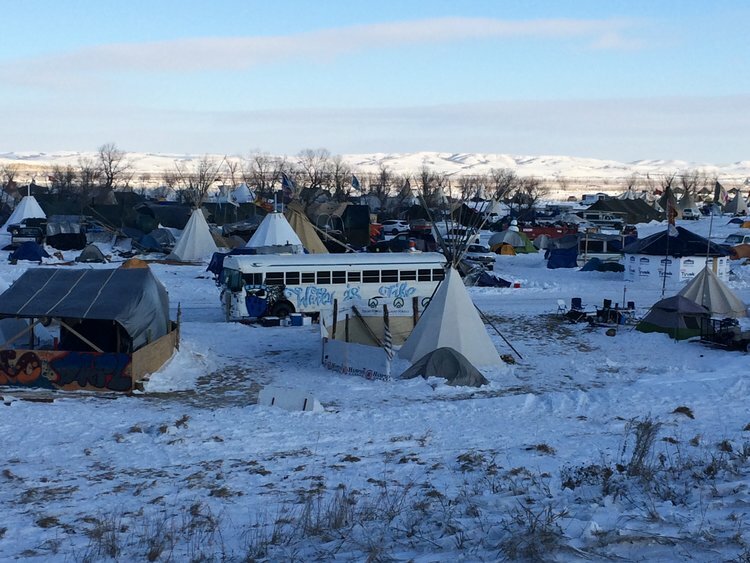 I was arriving after the Army Corp of Engineers announced it would not approve the easement (a decision that has recently been reversed), after the mass influx of veterans had come and most had left, and the day after David Archambault II, the chairman of the Standing Rock Sioux tribe, had asked people to go home. The woman I reached out to sent a condescending and scolding message in response to my request for help. The elders of the Seven Councils, who guided what happened at Oceti Sakowin, had not made the request Archambault made. “It is hard to know which voices to listen to,” I was told by numerous friends who had been at camp. Receiving conflicting information and advice about the best plan of action, I stayed in Bismarck both to catch up on sleep and to get more information about whether or not I should even go to camp. After scouring what news I could find and talking to a few people on the ground, I felt comfortable with the decision to go to camp, so I put a message on the rideshare page. A lovely woman, who was in town for a court date from a direct action she had participated in a few months before, was driving people between Bismarck and camp. She would accept no money for the ride. As she drove carefully on the icy, snow-blowing roads to camp, we exchanged stories. Just before we pulled into camp, she picked up a scruffy hitch-hiking man looking for a ride to Bismarck. His entrance into the car overwhelmed the air with the smell of fire. FIlled with joy and gratitude, I thought, “This is what I’ll smell like when I leave."